The opening moments of 2010’s The Dead, where a lone figure walks across the Sahara Desert, are absolutely gorgeous, and look as if they might have been lifted from a BBC nature documentary. The serenity of it all is eventually broken, however, by a man, his leg badly mangled (two bones protrude from the side of it), walking towards our protagonist. This man is a zombie, the walking dead, and he’s immediately followed by another… and another… and another. 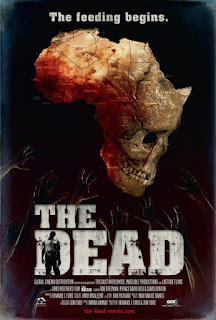 Despite its often-stunning scenery (it was shot on-location in Ghana, Burkina Faso, and other areas of Africa), The Dead is a no-nonsense horror film about a zombie outbreak, and the difficulties that 2 characters face as they try to make their way to safety. The dead have returned to life in West Africa, and are feeding on the living. Lt. Brian Murphy (Rob Freeman), an American engineer, finds himself stranded when a plane carrying him and a handful of others crashes soon after taking off. The only survivor of the ordeal, Murphy is anxious to find another airport so he can return home to his wife (Katy Richardson) and daughter (Fae Ford-Brister). Along the way, he meets Sgt. Daniel Dembele (Price David Oseia), an African solider searching frantically for his son (Gaal Hama). Working together, they commandeer a vehicle and head deep into the desert, with the dead hot on their trail every step of the way. 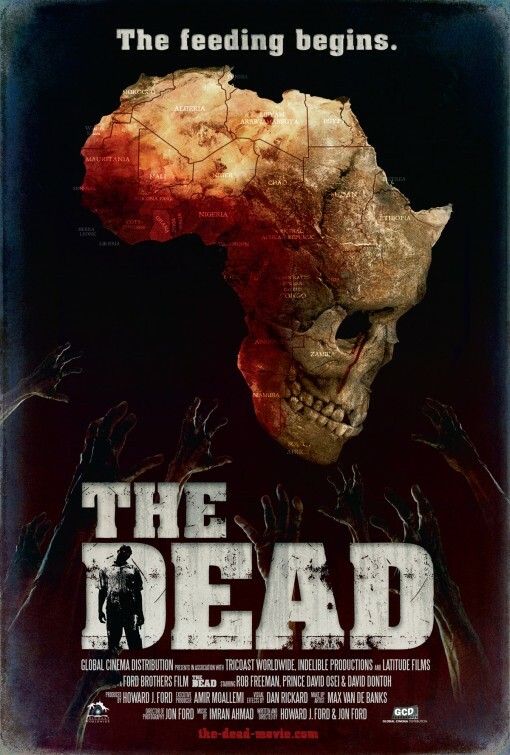 Directed by brothers Howard and Jon Ford, The Dead has quite a bit in common with George Romero’s Living Dead series. Along with moving very slowly, the zombies in this film are literally everywhere. As a result, Murphy and Daniel must remain constantly on the move; whenever they stop driving for one reason or another, the dead start lumbering towards them. Sure, they’re easy to outrun (so as not to waste ammunition, neither Murphy nor Daniel will shoot an oncoming zombie until it’s right on top of them), but the living dead are relentless in their pursuit. Even at night, the two leads cannot lose focus or take it easy. This is what gives the movie its tension, which grows stronger with each passing scene. The gore effects are also excellent, with realistic bite wounds, violent head shots (one zombie gets his face caved in by a shotgun blast), and body parts strewn about (not all those who are bitten get back up; sometimes, there’s nothing left of them but a puddle of blood and guts). All this, plus the vast quantities of living dead that populate the film, make The Dead a highly effective, not to mention very serious, horror flick. I’m a fan of Shaun of the Dead, Zombieland, and the like, but it was good to see a movie that reminds us just how frightening zombies can truly be.